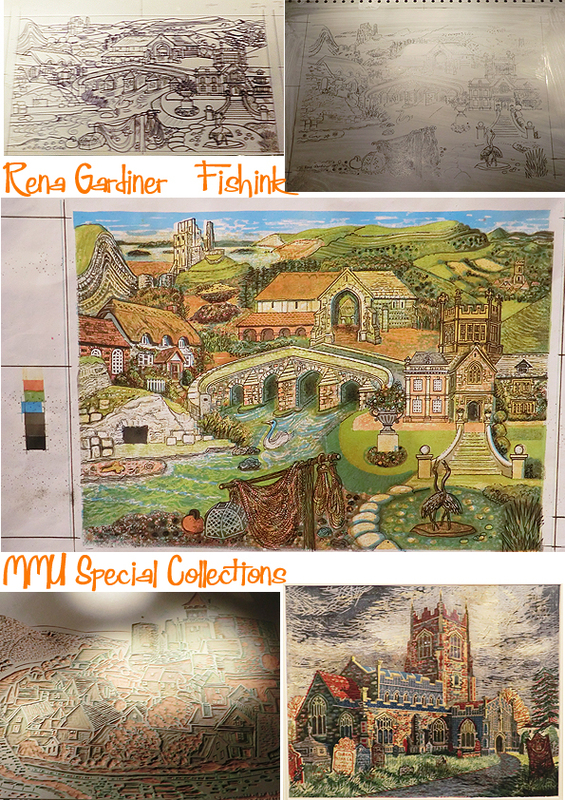 For those of you who managed to get to see the (now ended) exhibition at the MMU Library, Special Collections Gallery that ran for just over two months, you’ll know what a joy it was to see some of Rena’s work, ‘up close and personal’. I was lucky to find the time to pop into Manchester last wet Wednesday, especially to see it, and was very thankful that I had. 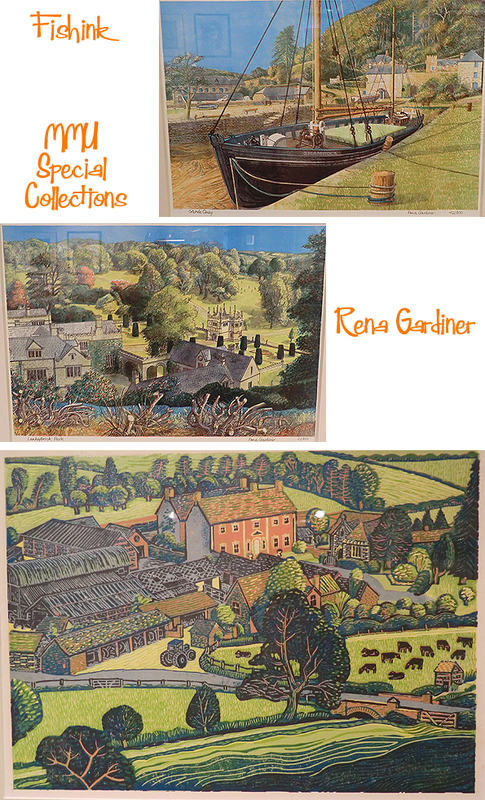 Sadly it’s very difficult to get decent images with everything being behind glass, but I hope you can see just how beautiful Rena’s illustrations, water colours, lithographs and lino-cuts really are. 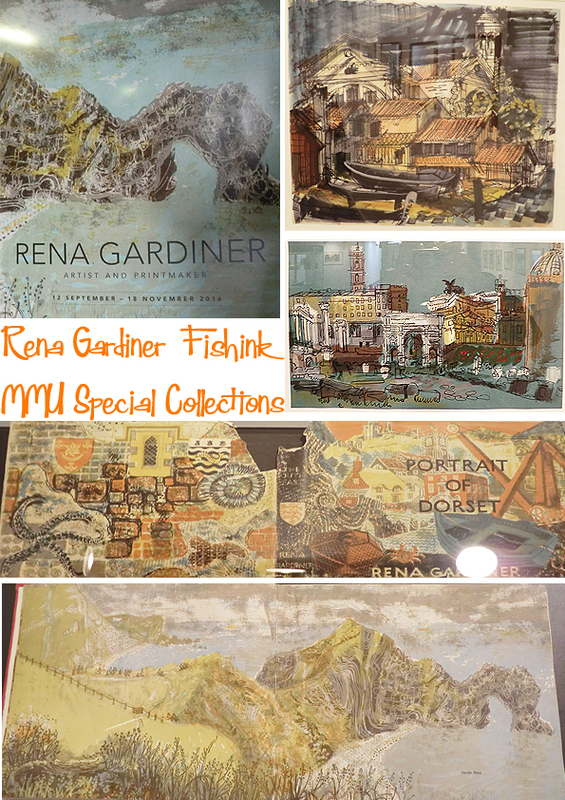 Rena Gardiner found a way to reconcile a one-woman industry with mass production without compromising her artistic integrity. She adopted elements of commercial printing but bent them to her purpose, crafting everything herself. She treated a commercial press like a hand press and produced books and prints that were in every sense handmade. Her work exemplifies the printing process known as autolithography, where the artist draws directly onto the lithographic stone or plate with no intervention of another hand or photography. Rena’s particular contribution to the art was the way she used the commercial press as a creative tool to develop and explore her images and not simply as a means to produce an existing image. It was most unusual for an artist to take on every aspect of organisation and production. 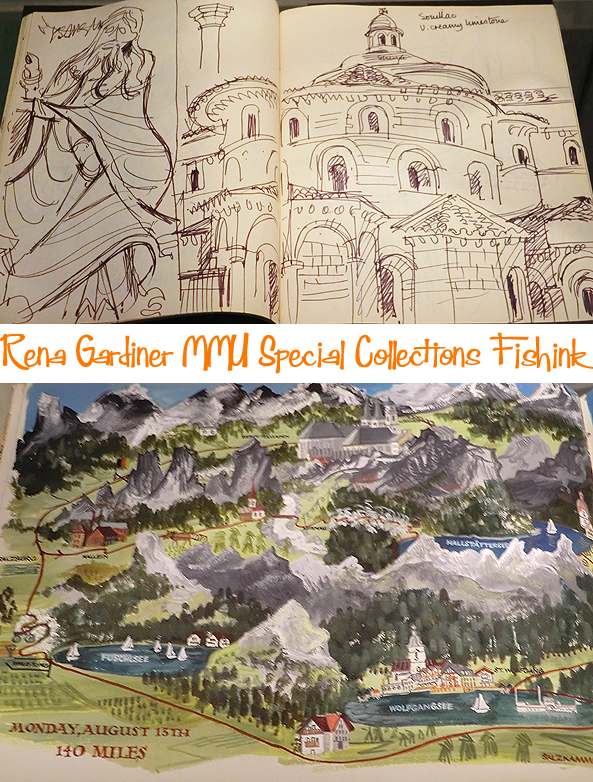 The highlight of the exhibition for me was seeing Rena’s sketchbook and this wonderful collection of holiday paintings. I would have loved to have seen more inside this sketchpad (above). 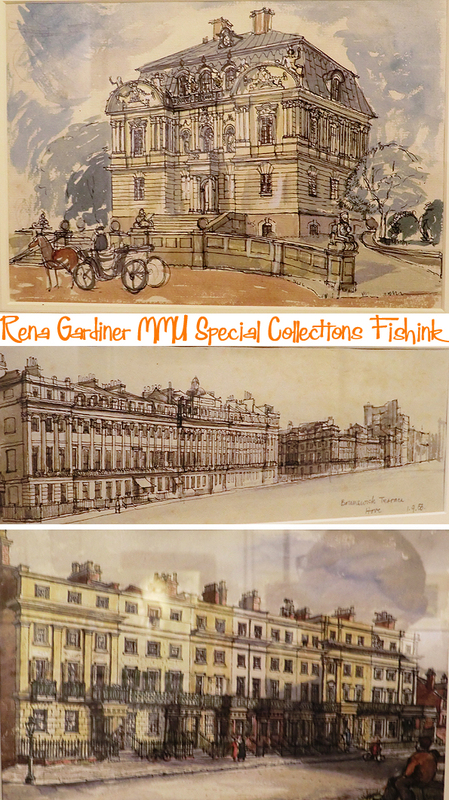 Rena’s passion for history, buildings and the landscape emerged early on in her work, and she would pursue these themes for the rest of her life. After completing her studies at Kingston Art School and gaining her teacher’s diploma, her first post was in Leamington Spa. In 1954 she moved to Wareham in Dorset to teach at the Bournemouth School for Girls. She fell in love with the country, which became her home for the rest of her life. She saw herself as an artist expressing herself primarily through the medium of printmaking. 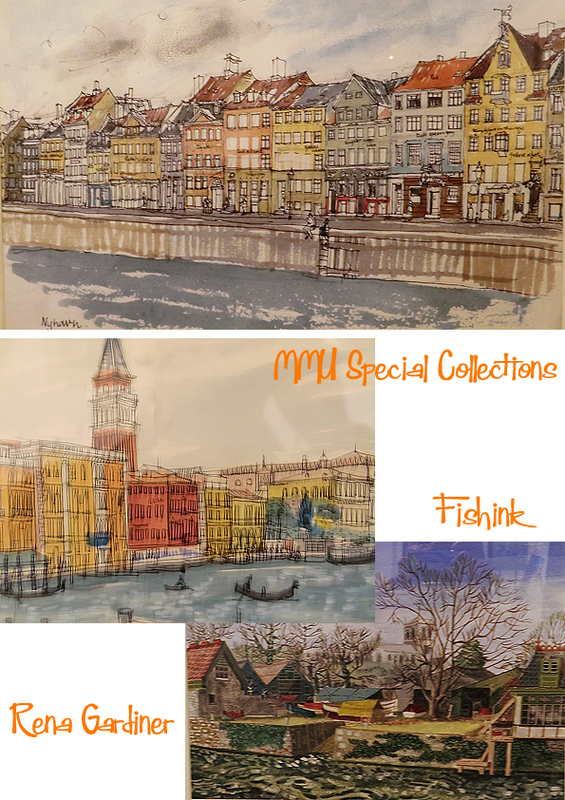 She experimented with book illustration and the craft of making books, and also began to travel abroad where she was influenced by the vibrant colour and architecture of Venice and Rome. This early period saw the maturing of her skill and talent for drawing, painting and printmaking and, in particular, her very personal approach to lithography. Such attention to detail and a keen eye for the accuracy of what she is drawing too. It was the generation of artists who had been establishing their reputation before the War that inspired Rena. 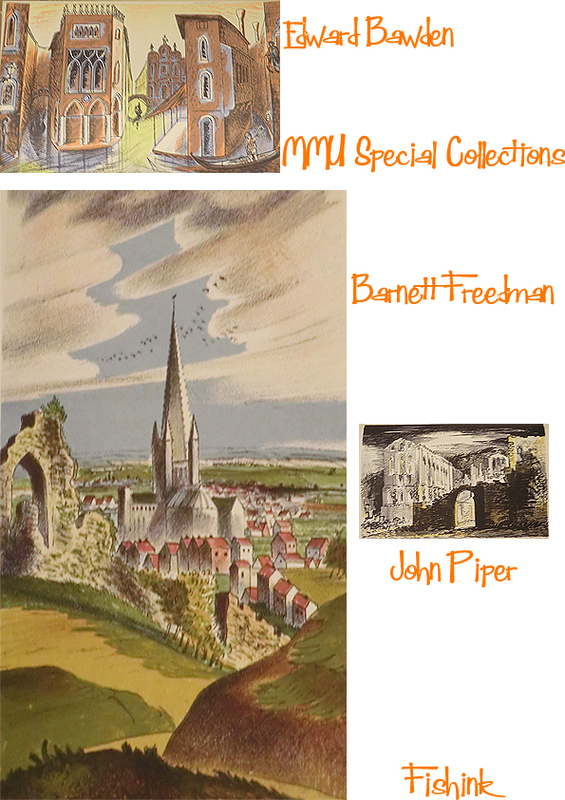 Eric Ravilious, Edward Bawden, John Piper, and Barnett Freedman, all of whom made lithographs. 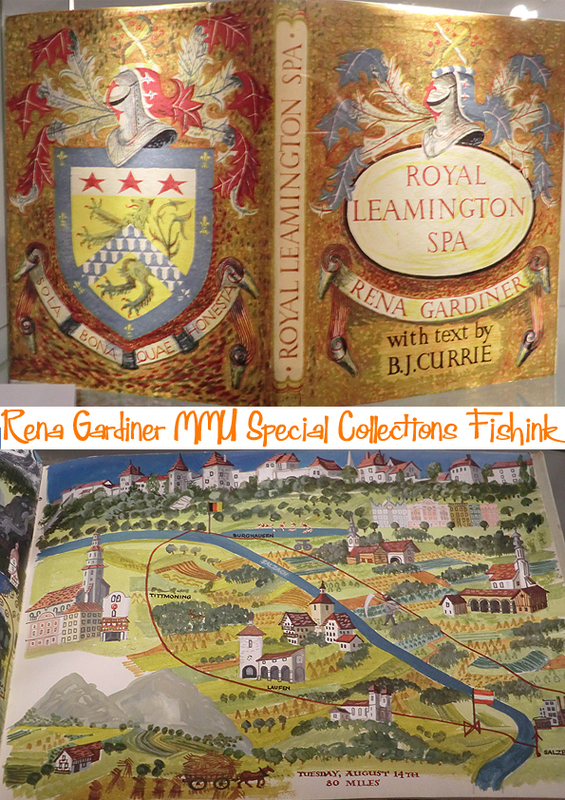 Rena visited exhibitions organised by the Recording Britain Scheme initiated by Sir Kenneth Clark as an extension of the Official War Artists Scheme. 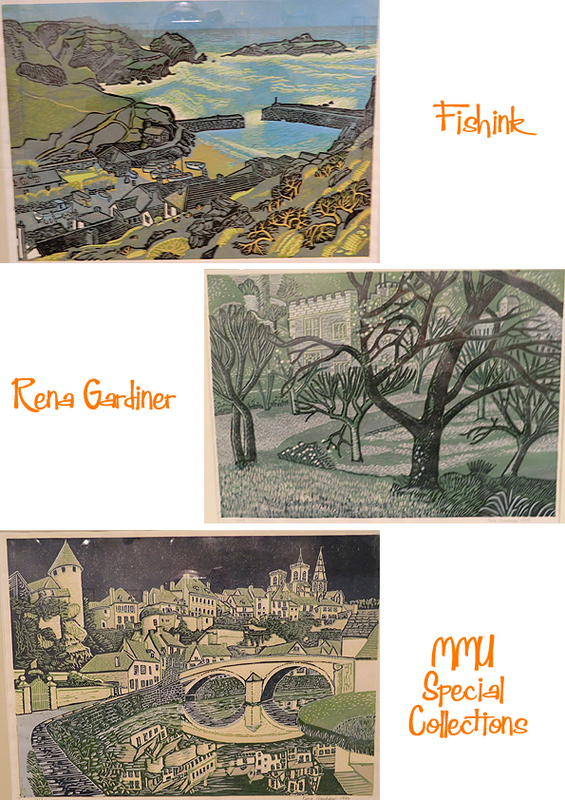 This featured such artists as Kenneth Rountree, Thomas Hennell, Rowland Hilder, Enid Marx and Barbara Jones. 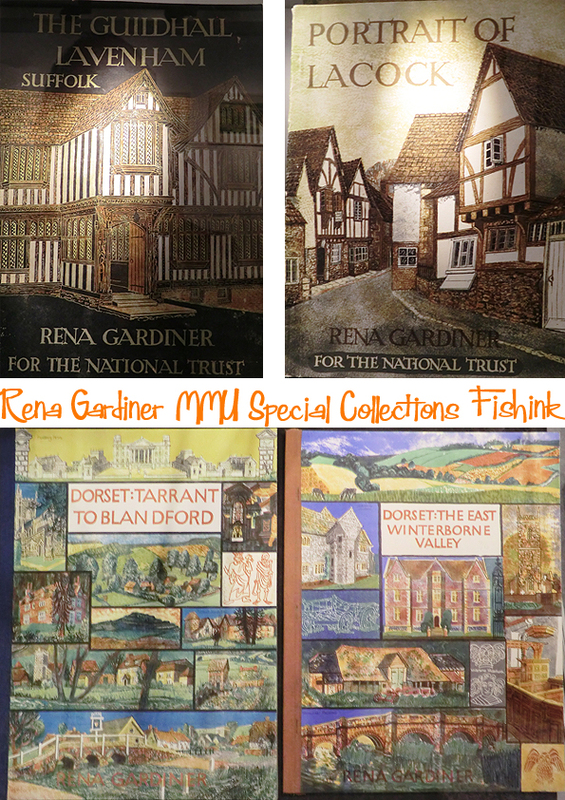 Rena was an avid reader of John Betjeman’s and John Piper’s Shell Guides as well. However she also admired the work of topographical artists of the past such as Thomas Girtin, John Sell Cotman and Thomas Shotter Boys, and the technique of the great lithographers such as Honore Daumier. 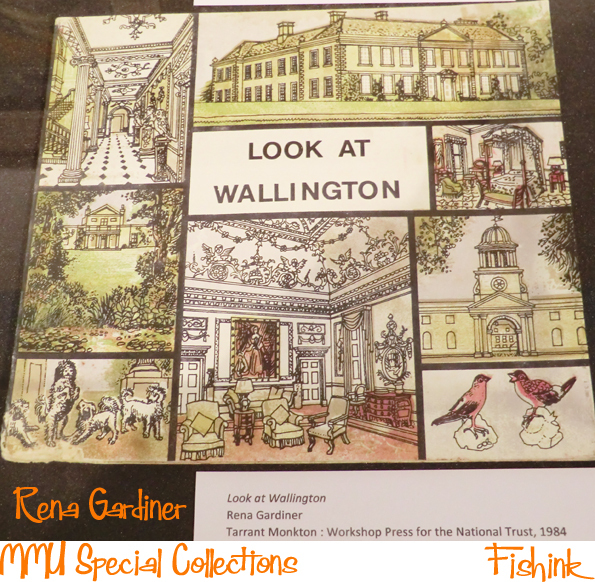 Rena was also familiar with the Puffin Picture Books published by Penguin and edited by Noel Carrington, and recognised the influence they had on her own work. Full of brightly coloured and freely drawn illustrations which relied on autolithography for their vitality and economy, they introduced Rena to another group of artists such as Clarke Hutton, Hilary Stebbing, Kathleen Hale and in particular S.R. Badmin. In 1965, Rena moved into a cottage at Tarrant Monkton, near Blandford Forum, where there was sufficient space to install a commercial printing press. Her book production began to flourish. She established her relationships with the National Trust, Salisbury Cathedral and other clients and by 1970, she was making enough money from the books to give up teaching and concentrate on book production. She still found time to produce paintings, pastels and drawings of England and abroad. The paintings from France show her particular interest in Romanesque architecture and sculpture. 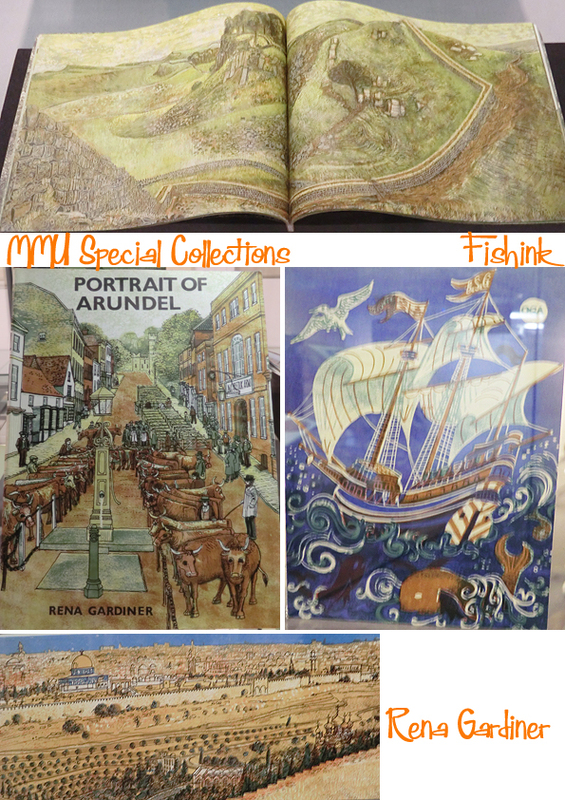 During this period she produced many of her most successful books and mastered her illustrative technique, exemplified by three large-format books on Dorset and the books about Cornwall, starting with Cotehele in 1973. By the time she was in her sixties, Rena found the pressure of book production an increasing burden, and her last new book was produced in 1996. She still worked on reprints and editions of existing books, but wanted to slow down. 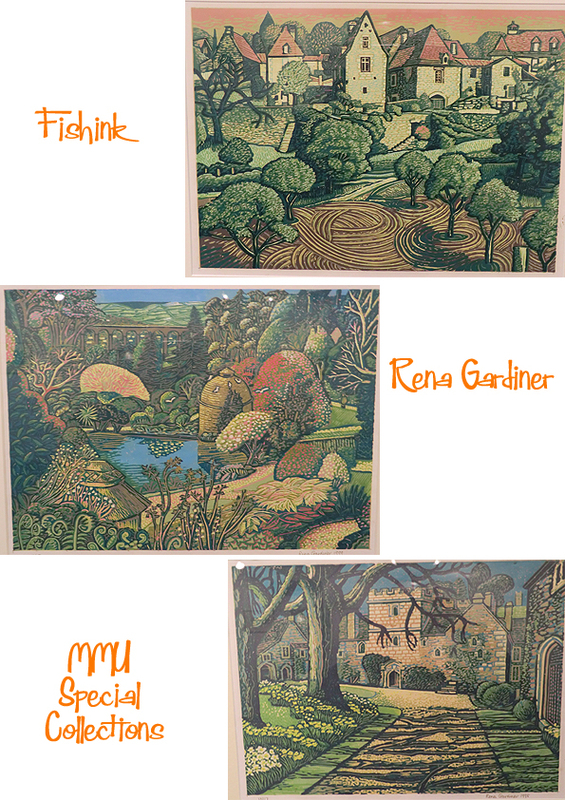 Rena returned to the art of printmaking and revived her interest in lino cutting. Her subject was her beloved Dorset and she took the opportunity to travel abroad and make prints of Italy and France. 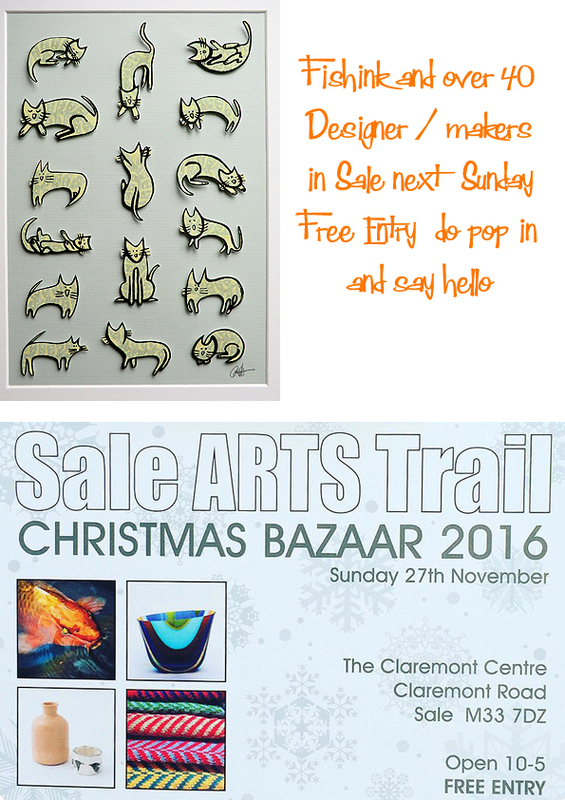 In the late 1990’s she spent time in the beautiful surroundings of Cotehele in Corwall and produced a collection of 35 linocuts. So pleased I finally got to see this exhibition before it ended. Hope those of you who didn’t get there, enjoyed it through my images too. Thanks to Martin Andrews for some of the information used in this post. Such detailed and delicate work. I like how Gardiner did it ‘her way’ and made the process work for her. Also, I wish my sketchbooks looked like hers! Very true Ali, such a dedicated lady. I would also love to be that good with a paintbrush. Mere words are insufficient… beautiful. The detailed scenes draw one in. Thanks for bringing this to us Craig.